Members of Congress recently joined community and corporate leaders to honor the 283 recipients of the 2014 Congressional Award Gold Medal in Washington, D.C. and in ceremonies around the country. 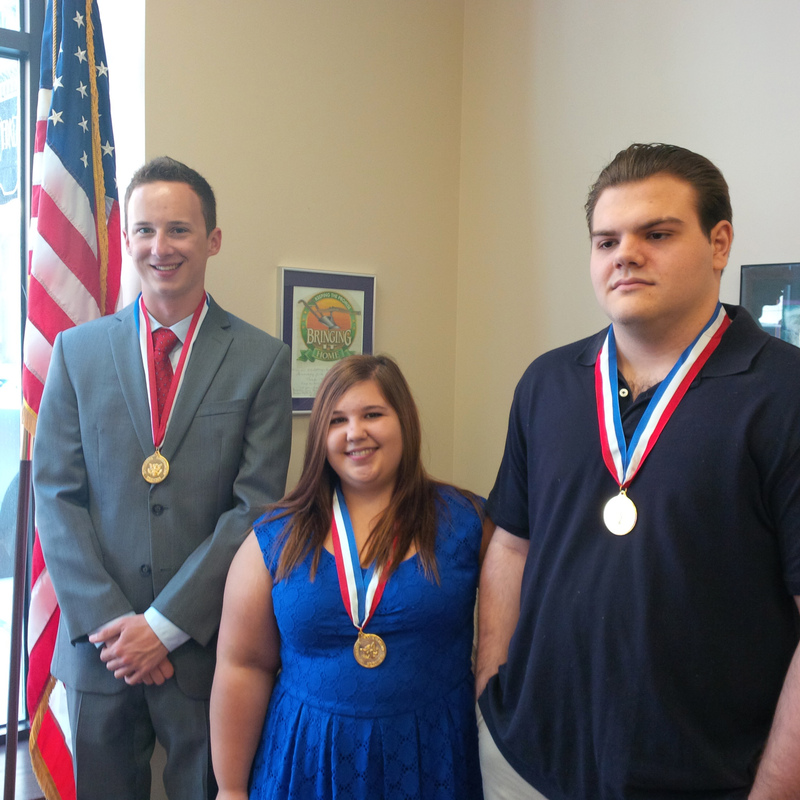 Three alumni from Haysville USD 261’s Campus High School received their Congressional Award Gold Medal in a ceremony in Wichita with representatives from the offices of U.S. Senator Pat Roberts, U.S. Senator Jerry Moran and U.S. Representative Mike Pompeo. Alumni honored were: Robert Youel (Class of 2014), Dhonovan Hauserman (Class of 2013) and Jackie Shipman (Class of 2011). This annual event highlighted Congress’ highest honor for youth and recognized individuals that have dedicated hundreds of hours of service in their communities. Since its inception in 1979, the Congressional Award has recognized thousands of young Americans committed to serving their country and improving themselves, representing over 3.5 million hours of public service and 35,000 students – all of whom are actively working toward their Gold Medal. At the center of this event are the 283 medalists that took the challenge and dedicated hundreds of hours to Voluntary Public Service, Personal Development, Physical Fitness and Expedition/Exploration. Youth are not given this honor, but earn it based on the guidelines in Public Law 96-114, The Congressional Award Act. The Congressional Award, a public-private partnership, established by Congress in 1979 under Public Law 96-114, is a non-competitive program open to young people ages 14-23, regardless of mental or physical challenges, or socioeconomic status. The Congressional Award Foundation teaches participants to set and achieve personally challenging goals that build character, and foster community service, personal development and citizenship. Each of the Campus High School recipients was featured in the ceremony program. Robert Youel: To earn my Congressional Award Gold Medal, I completed over 400 hours of Voluntary Public Service work through numerous organizations in my community. I did a multitude of different tasks, ranging from aiding tornado victims to cleaning up various places in my town. For Personal Development, I attended Boy Scout meetings and eventually attained the rank of Eagle Scout. For Physical Fitness, I participated in swimming and attended practice on a regular basis. I consistently improved my performance at each meet. Last, for my Expedition, I coordinated a campout for my troop. We cooked, hiked and canoed. I enjoyed earning my Congressional Gold Medal and it showed me I can do anything I set my mind to. Dhonovan Hauserman: I devoted my Voluntary Public Service to a variety of services. I developed and implemented Dixie’s Legacy, to donate to local animal shelters and disaster areas in helping displaced animals affected by natural disasters. I also refurbished cell phones for a local women’s shelter. Incorporating service into my life was very satisfying and it has inspired me to continue. For my Personal Development, I enhanced my computer programming and competed at the state and national levels. I also assisted a local Deacon with maintaining database financial reports. For my Physical Fitness goal, I became more physically fit through daily workout routines. For my Expedition, I decided to hone my hunting skills and outsmart a deer. I also had to endure extreme cold weather. It is a tremendous honor to earn the Congressional Award and I am truly appreciative of the experiences that have lead me here. Jackie Shipman: I completed 500 Volunteer Public Service hours in various places including an elementary classroom, collected food for a local food bank and worked numerous community swim meets and local parades. I also purchased, wrapped and delivered toys for needy families. For the Personal Development activities, I completed 228 hours of playing the piano fluently. For my Physical Fitness goal, I went from doing Zumba workouts for 30 minutes to 45 minutes. I learned to play the piano by music and sound. For the Expedition/Exploration activity, I planned a trip to Washington, D.C. to explore the historical sites. I researched and book hotels and plan tickets, I researched historical sites, restaurants and transportation. I had fun working on the Congressional Award Gold Medal and learned how to discipline myself.